There are quite a few angels and saints in the book of Acts in the Bible. If you've been following my What IFs blog, you'll know I'm working my way through acts, writing study questions while I prepare to write more children's stories - Peter's Promise and Paul's Purpose perhaps? Meanwhile my publisher at Cape Arago is working hard on getting Jerusalem Journey ready for print. With any luck, I'll have a complete set of four New Testament children's story books ready for Christmas giving, and four would be a really good number wouldn't it? I've sent off the order, and soon a large parcel will arrive, loaded with copies of the journal from our local writers' group. It's a great journal. It's got a fantastic cover. And all proceeds go to the library that hosts us so... why not check it out on Amazon? I learned a lot while working on the journal. Mostly, I learned, I've still got tons to learn. I learned that people with better software than me can make fantastic covers, bypassing the cover creator I've used online. I learned that people with better training than me can design gorgeous interiors, knowing by instinct how to fix what "doesn't quite look right" to me, and avoiding all those beginner mistakes I made. Do the top lines match - not always, but they should. Are short paragraphs kept on single pages - not always, but I'm getting better at it. It's nearly done. Release date is almost here. 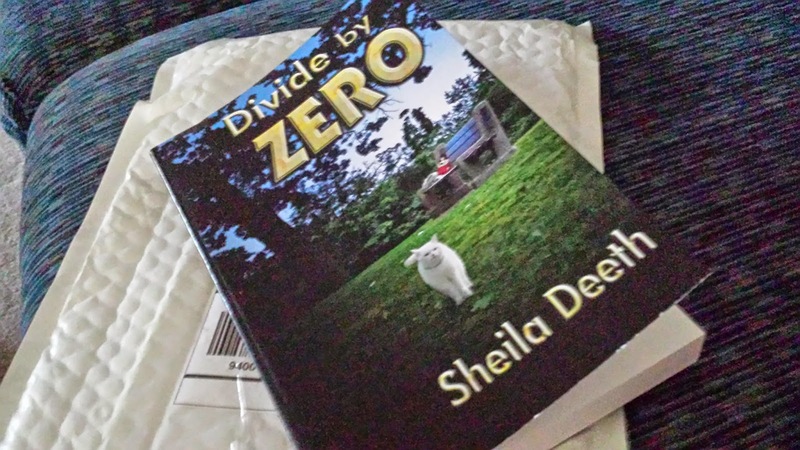 And Divide by Zero will soon be dividing zeroes everywhere. It takes a subdivision to raise a child, and a wealth of threads to weave that tapestry. But when one thread breaks, it just might take a child to raise the subdivision. And dividing by zero might not mean infinite problems or cruelty. It just might mean hope, love, or forgiveness. Thank you Second Wind Publishing for giving my first novel its second wind. And watch out for Infinite Sum, coming soon! At Christmas and birthdays I receive these cool rectangular parcels, all filled with books. Then, throughout the year, I receive more cool rectangular parcels through the post, all filled with books. Then I line my bookshelves and stand half-toppling towers at their side. Then my husband asks, "Why do you want more books?" I won a book on facebook recently and told the author I was really looking forward to reading it - I am - but it might be next summer before I can post a review. I do post reviews of books I read "just for me," but that's beside the point. The author replied that her review-list stretched into next year too. When I asked why we do this to ourselves she wrote, "because we're addicted." Indeed we are. Still, there are worse addictions. And here are some more book reviews to feed your inner addict. Grab and coffee and enjoy! Our Writers' Mill Journal is almost complete. We have a beautiful cover, designed by the wonderful Patricia Burraston, and lots of great stories, essays and poems. The pdf file looks great, and we're ready to go. But getting that pdf file to look great has taken time-and-a-half from my schedule recently, and I feel like a student struggling not to flunk the test. There's so much to learn; so many great ways to make a book look professional. And I know I shall now end up checking for errors on all the books (real, physical, paper-printed books) I read. Today I'm delighted to welcome author Christine Amsden back to my blog with the final story in her much-loved Cassie Scot, Paranormal detective series. I've really enjoyed following these stories of a girl with unclear powers in a small town where power is so nearly normal that normals and paras form rigid groupings eager to take offense. In a real world where being different is always a risk, these exciting romantic suspense tales offer readers a timely touch of depth and consequence, raising them well above the "normal." As I've enjoyed the books, I've found myself wishing I knew more about how Evan and Cassie related to each other back when they were kids, back when Evan was protecting the unexpectly magic-less girl born of a family filled with power. And today, Christine has offered me just what I wanted! Read on and enjoy!